The board itself must be constructed each game. Each of the three kingdom regions is on its own double sided board. Thus, there are 8 different arrangements that you can play with. Each region has five cities in it, and each of these (save one) gets a reward token placed on it at random. The final city is the King’s city, and has the King’s pawn placed on it instead. 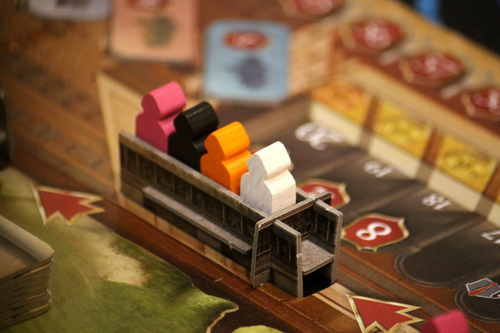 The King board is placed at the bottom of these regions, and this holds the VP track, the Nobility track, gold track, and an area to hold most of the cards. Each player gets all the pieces in his color, some starting money, and possibly some assistant tokens. There is a Nobility track on the King’s board – 20 spaces in length – with a number of bonus icons interspersed on the spaces. Your marker moves forward on this track as you collect permit tiles or bonus tiles that have a gold arrow on them. As you move forward on the track, you will cross spaces with icons on them, and as you land on them, you will gain things such as VPs, coins, permit tiles, politics cards, etc. 1) Draw a card – Draw a Politics card and add it to your hand. As I mentioned in setup, each of the three regions is controlled by a Council of Four (there are six different colors of councilors). They sit in a balcony that looks over the region. With this action, you take an available councilor from the side of the board and insert it into the left side of any of the three balconies – so that the rightmost councilor falls out. You also gain 4 coins for taking this action. Using one of the previously collecting permit tiles, you may build an Emporium on any city whose initial is found on that tile. You can only use a tile once, so once you build an Emporium with it, turn it face down. You may only build one Emporium in each city. When you build, you must be able to return one Assistant token to the supply for each other Emporium previously built in that city. 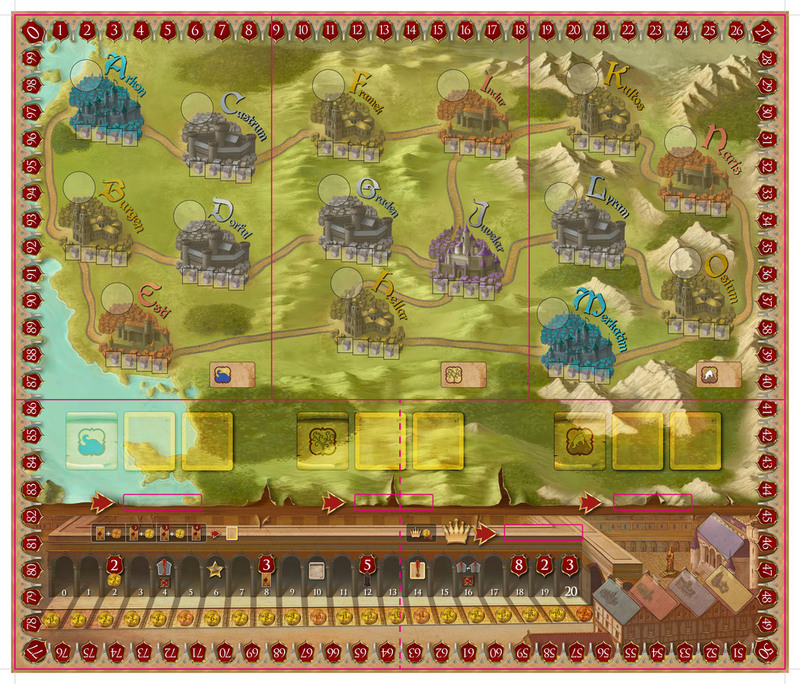 You then immediately collect the building bonus for that city (pictured just above the city) as well as the building bonus of every other city that is connected in a chain to the current city which also has one of your Emporiums already built in it. After building, also check to see if you collect a bonus tile for building an emporium in all cities of one type or all cities in one particular region. The King has his own council – and you must play cards and coins to it just as you would with getting a Permit tile. However, in this case, you do not get a tile. You then gain the right to pay to move the king, 2 coins per road segment, and then you are able to build an Emporium in the city where the King stops his movement. You may only build one Emporium in each city. When you build, you must be able to return one Assistant token to the supply for each other Emporium previously built in that city. You then immediately collect the building bonus for that city (pictured just above the city) as well as the building bonus of every other city that is connected in a chain to the current city which also has one of your Emporiums already built in it. After building, also check to see if you collect a bonus tile for building an emporium in all cities of one type or all cities in one particular region. Quick Action 4 – Perform an Additional Main Action – Return 3 assistants to the pool and take another Main Action (you may even take the same Main Action twice). The player with the highest VP total wins the game. If there is a tie, the player with the most assistants and politics cards wins. 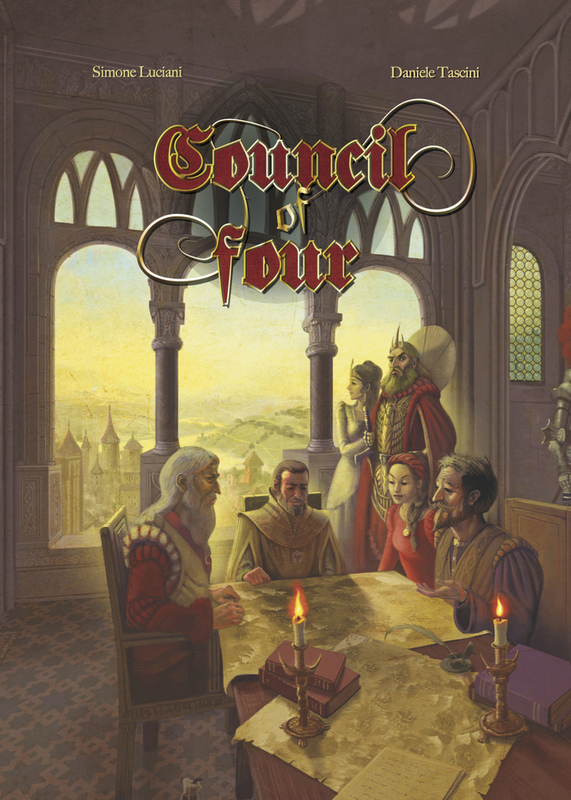 I have very much liked my initial plays of Council of Four. It feels a bit old school and reminds me of a lot of the games that brought me into the hobby. There are enough mechanisms in the game to give you something to chew on each turn, but not so much that it will grind to a halt with analysis paralysis. There are also multiple ways to score points in the game, and you are racing against your opponents to get the best scores for your actions. At the start of the game, I like to look at the board setup (as there are 8 ways to arrange the board segments) and then the city reward tokens are randomly placed – to see if I can see a combination or two of connected cities that I would most like to exploit. The reason for this is the cumulative nature of the Emporium bonuses; if you can start with a group of cities linked together, anytime you grow that network, you’ll get a bunch of the bonuses over and over. I personally like to get a nice source for assistants set up as they are expensive to buy on your own, and you need them to push your way into a crowded city in the endgame or to take the other quick actions. However, I have been defeated by my son who has prefers to link up the 3VP and 2VP cities early one and then pound that network to continue to score VPs at an alarming rate, so even here, there are multiple options. Thus, it makes sense to try to connect up the cities as you build them as you will get additive rewards that can become quite large near the end of the game. However, the bonus tile system wants you to build separately – especially the bonuses for blue and pink – because their very small number of cities guarantees that they won’t be easily connected to each other on the map. There is one possible issue with the bonus tiles, and that is the disproportionate scoring that can arise from the king’s bonus tiles – which almost always end up going to the blue or pink area bonus. Getting 25 VPs (for the top king tile) in addition to the first bonus tile turns the start of the game into the inevitable race for being the first to complete a bonus. I don’t think it’s a broken mechanism, and the staggered starting positions (in terms of assistants) gives players a somewhat balanced chance to win the 25VP prize – but that amount seems high given the endgame scores. [The king’s bonus tiles are 25 VP/18 VP/12 VP/7 VP/3 VP] Getting one third or one fourth of your total score from a single bonus, one that may have just fallen in your lap from a lucky tile draw, can sometimes leave a bad taste in your mouth. I do not claim that this is a broken mechanic though because winning that 25vp tile does not seem to guarantee victory. The actions in the game are well balanced, and while it’s easiest to get a tile when the council lines up for the cards in your hand, you’ll otherwise be jockeying for money, assistants, cards, etc in order to get the actions you want. Don’t forget that if you have enough coins, you can also just use the King to build wherever you want – and this can be a helpful shortcut sometimes. Gameplay is quick here, with our games taking right around an hour to finish. In that time, the individual turns go fairly quickly, so I have been engaged throughout the entire playing time. Usually, I’ll spend most of the time on the other players turns figuring out what I would want to do with the current board state, and then if someone has bolluxed up my plans (usually by changing the council composition at a place or by building in a city where I was going to build and now I don’t have enough assistants to go there), then I’ll look for something else to do. Generally, there will be two or three places that I’ll want to build next – but the final choice will depend on a number of factors including competition for bonus tiles versus larger and larger bonuses granted if I manage to continue building contiguously. Thus far, this has been one of my favorite games from Essen 2015, and this is one that I am sure remains in the game collection after the reviews are written. Dan Blum (1 play): I hadn’t paid much attention to the details of the Essen releases so I was pleasantly surprised to find that this was an old-school Euro: short and fairly streamlined, without lots of extraneous mechanisms. It works pretty well, too. LIke Dale I was somewhat worried about the strength of the first King’s Bonus tile, which can be easy to get early on, but I concur with him that it is probably not too strong (I got it and I won, but not by very much, and I would hesitate to draw balance conclusions from one game anyway). Jonathan F. (1 play so far – I plan to buy it): I really enjoyed my play of this. It is old-school, but not super-dry. There are lots of unintended consequences, such as the previous player bumping a councilperson and now you cannot afford your move . . . or making it so you can afford a move you previously could not. I look forward to more plays of Council of Four. I have one issue that keeps it off the “Love It” line, it is fiddly. Scores can be close, but there is a ton of moving down different tracks 1 or 2 at a time. I have no idea how to solve it, but even with the best of intentions, you might given another player a few points too many or too few. I’m not sure if using poker chips rather than the scoring track would make it better or worse. I really like the combination of networks, variable map, and bonus tiles for being in far flung cities, thereby creating a nice tension between clumping and spreading.